Apartment is a 'granny flat' located above a garage, away from the street, and has a nice ocean view from the living room and porch. Free and easy parking, wifi included. Very centrally located- 5.5 miles from Ocean Beach, 5.8 miles to San Diego Zoo/Balboa Park, 6.5 miles from Sea World, 7.4 miles to Little Italy, 8 miles to Petco Park/Downtown/Convention Center, 9.5 miles to La Jolla, 9 miles to SDSU, 2.8 miles to USD, 12 miles to UCSD. Apartment is cozy, with compact living room and kitchen, but large bedroom with walk-in closet, and good sized bathroom with shower/bathtub. House looks down on the rest of the neighborhood, and makes you feel like a bird in its nest! Very cool in summer- we lived here when we first bought the house (a very hot summer), and never slept without the comforter while all our neighbors were complaining about the heat. House overlooks the backyard, which is filled with fruit trees. Living room looks west toward ocean. Granny flat is accessed by a series of steps that go up to the apartment from the top of the driveway; outside the front door is a covered 'lanai' or balcony that overlooks the yard the and neighborhood to the northwest (mt soledad is clearly visible). Great spot for happy hour or a coffee in the morning. The door has a real wood door and a security screen- if you just lock the security screen in summer, you'll come home to a cool apartment. Our neighborhood has 'natural' air conditioning; the prevailing westerly sea breeze comes off the ocean, crosses mission bay, funnels into tecolote canyon at Sea World Drive, and then filters through our neighborhood. The apartment is very private- you do not share a wall with the main house, and the bedroom faces east and south, so you do not hear or see main house occupants. Inside the door is a small but cozy living room with two chairs, two lamps, a small table between the chairs, a tv with dvd and vcr, and a small bookcase with books, dvds and vhs tapes. Beyond the living room is a nice kitchen with full-sized fridge, gas oven and stove, a bistro-style kitchen table and two chairs, and all kitchen accessories- microwave, coffee maker, blender, toaster, knife set, etc. The bathroom is compact, with a decent vanity, a tub/shower with removeable shower head 'wand', and toilet. Between the bathroom and bedroom is a large linen closet with extra towels and sheets. 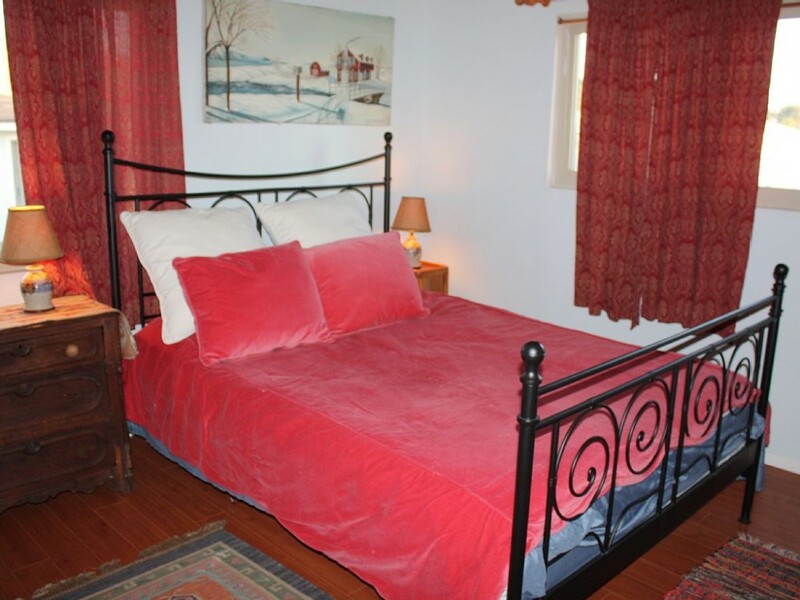 The bedroom is pretty big, with a queen size bed with premium memory foam mattress and a wrought iron frame. At the foot of the bed is a chest of drawers (9 in all) with lamp and stereo on top. There is a nightstand on the north side of the bed with a small lamp. Between the bed and the walk-in closet is a small desk with a few drawers and a chair. Inside the walk-in closet are extra blankets and pillows. The neighborhood is quiet. Unlike a lot of areas of SD (South Park, Little Italy, Logan Heights, Ocean Beach, Loma Portal, Point Loma, University City, Mira Mesa, Northern La Jolla all have significant and repetitive jet 'fly over'....remember 'Top Gun'? Filmed here), we have no jet 'fly over'. Parking is abundant and easy. Apartment is even quieter as it's away from the street and in the backyard. If you would like to see a lot of different areas of the city, but return to a nice apartment in a quiet neighborhood with easy parking, you'll probably like this apartment. Another 'ace in the hole' for this neighborhood (and this apartment) is that unlike Hillcrest, North Park, Little Italy, Ocean Beach, Mission Beach, Pacific Beach, La Jolla and Downtown, we have free, easy, and abundant street parking steps from the apartment. If you would like to visit all the aforementioned areas (some of which have jet fly over, all have parking problems), but would like to return to a quiet apartment in a safe neighborhood with easy parking, you'll probably like it here. 1) We clean the apartment ourselves, because only guests and hosts care if it's clean. We do not employ cleaners that have no 'stake' in the guest experience. 2) The bed is a premium memory foam mattress, and both mattress and box spring are zipped into 'anti bed bug' covers. These covers prevent bed bugs from entering the mattress or box spring. Not nice to think about- but you should, if you're traveling to an unfamiliar apartment that has been used by others. 3) You have cable tv/dvd....i think it's about 75 channels. 4) stovetop and oven run on gas. 5) We use premium bath tissue- not cheap single ply garbage. We're located in Linda Vista, in the heart of San Diego. We're close to the airport, Downtown, Petco Park, Old Town, Qualcomm Stadium, Balboa Park, Little Italy, Beaches, Sea World, SD Zoo, Mission Bay, North Park and other cool stuff. Bedroom is quite large, with lots of storage space in two chest of drawers, a desk, and a walk-in closet. Small stero/cd player in bedroom. Nice views of neighborhood from windows, high exposed-beam ceilings. Laminate flooring. Decent size bathroom with detachable shower head and full tub.